Royal Wedding fever has filled our beautiful Britain with so much love and hopes for the new couple. Now the day has finally arrived and we couldn’t be happier for the new Duke and Duchess of Sussex. 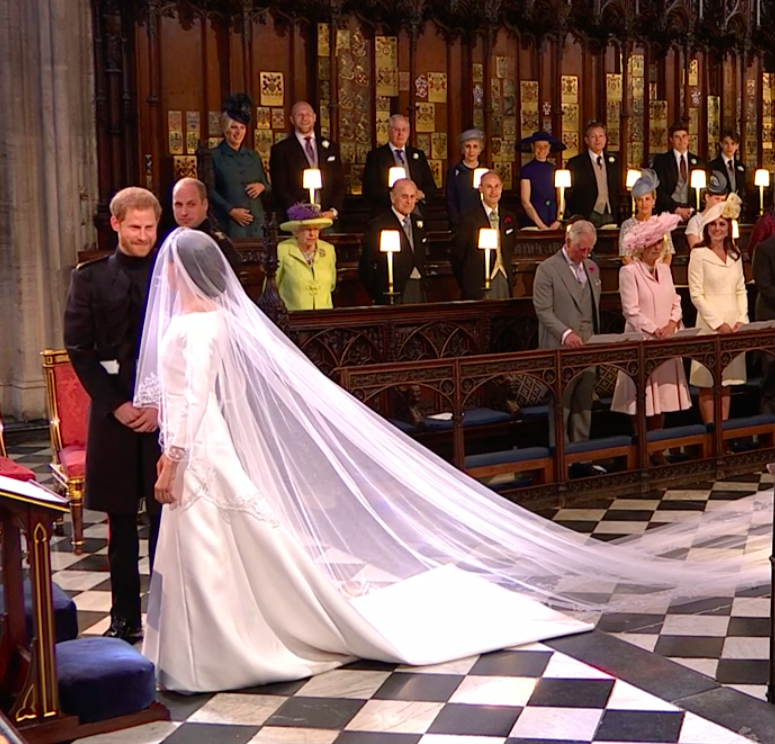 From the most ornate Floristry and that flowing veil, to the most handsome groom and THAT BANDEAU TIARA, this modern Royal Wedding had us not only in swoons of patriotic pride but (quite honestly) tears of helpless joy! 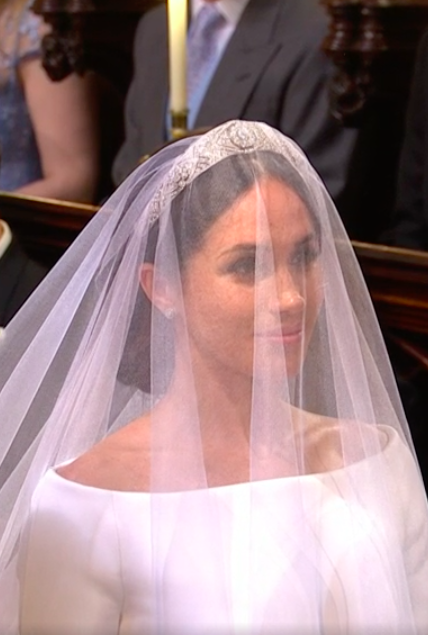 Less is More so the saying goes, and in the case of modern bride Meghan Markle, the new Duchess of Sussex, it can be done oh so beautifully. 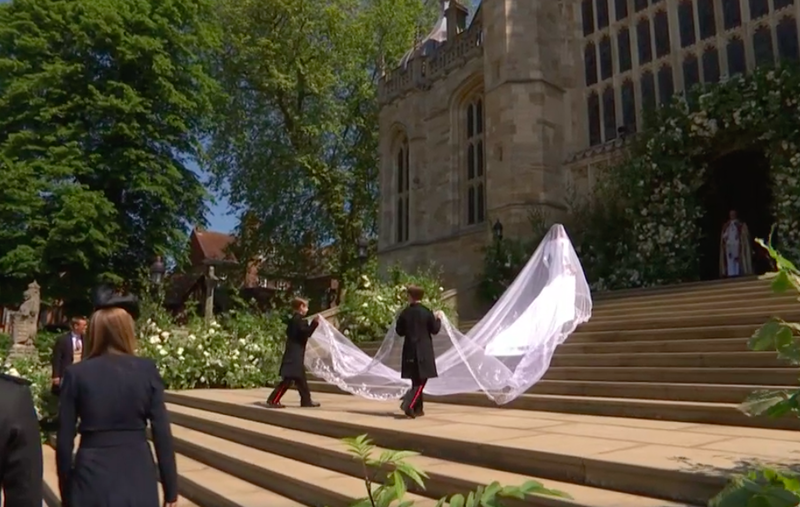 The gown that has been running through our minds since the Royal Couple got engaged back in November last year was finally unveiled, (and quite literally too) by the extremely talented Clare Waight Keller, Artistic Director of Givenchy. What an achievement for the successful French Fashion House, and goodness knows how they kept that under wraps for so long! Meghan chose a stunning Diamond Diadem to adorn her hair for the Royal Wedding. This rarely seen diamond tiara suited Meghan’s pared back sophisticated and elegant look beautifully. 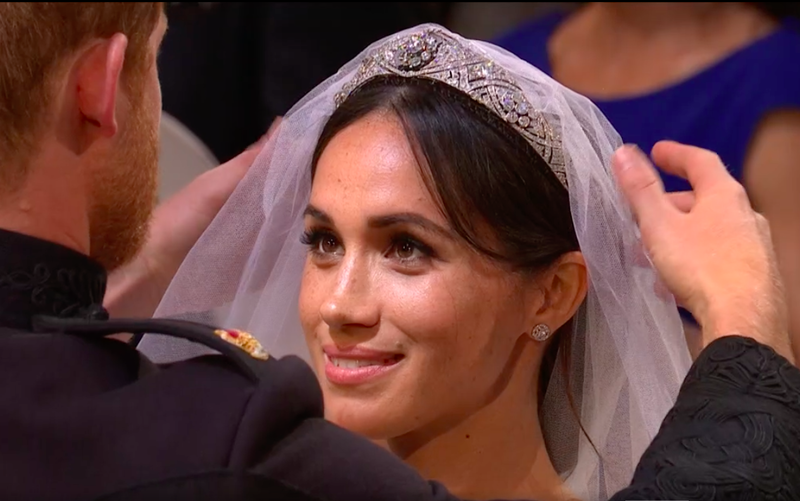 Embellished in diamonds at a beautiful height, framing her elegant chignon bun, Meghans Royal Wedding Tiara was the epitome of glamour, showcasing diamonds of multiple sizes. It’s flexible design secured her long and flowing veil of hand-embroidered commonwealth blossoms in place for her regal walk down the aisle. Her chosen headdress was complimented beautifully with her choice of Cartier earrings and bracelet. Meghan’s Royal Wedding Crown was in fact the Filigree Tiara once belonging to Queen Mary, Grandmother to HM The Queen and Princess Margaret. Made in in 1932, this stunning Royal Tiara is made up of eleven sections of diamonds framing a centre brooch dating back to 1893. This stunning detachable brooch was given to Queen Mary upon her own wedding day in 1893 by the County of Lincoln; quite a unique Royal Tiara. Considering a sophisticated look like Meghan’s Royal Wedding Look for your own wedding day? 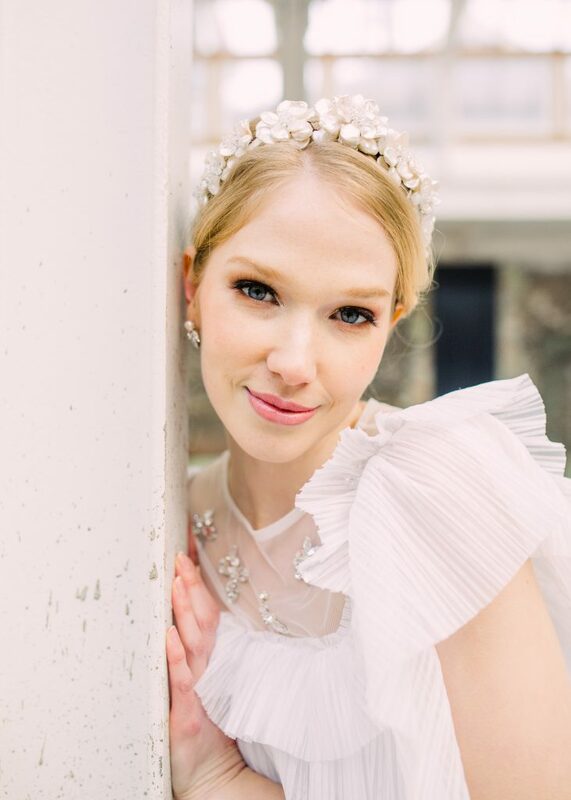 Our Kensington Tiara is a subtle sophisticated option for a bride desiring Meghan’s chic Royal Wedding Look. 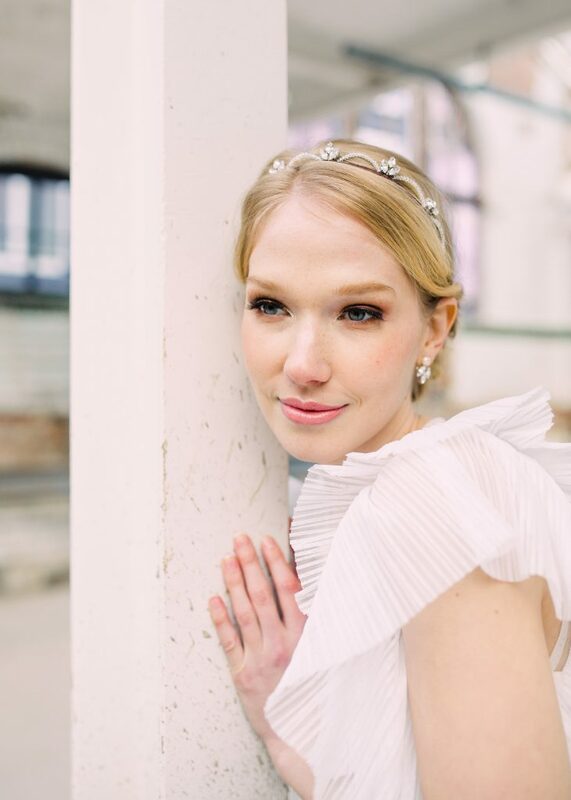 For a pearl offering of similar heights, you may want to consider our Wild Rose Tiara made of pearl blossoms and mounted to suit any hairstyle including Meghan’s Chignon bun hairstyle. 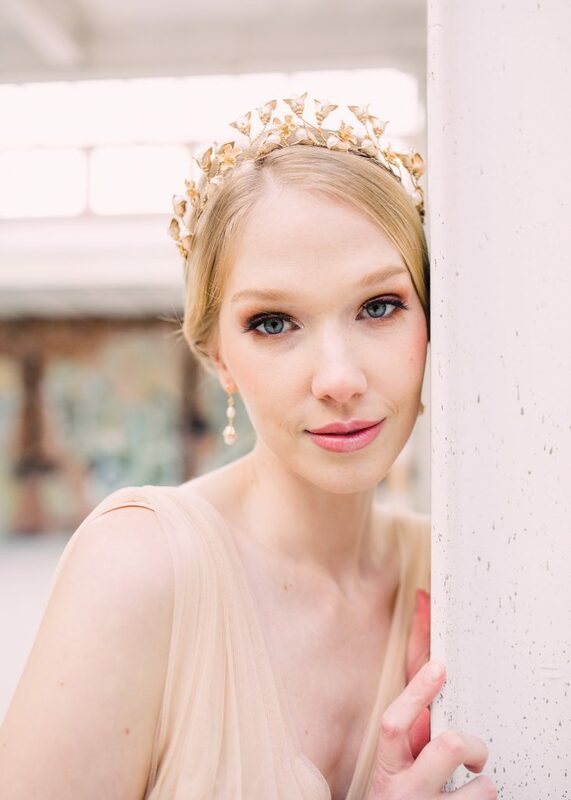 For a Royal Wedding Tiara of golden luxe, we would suggest our New and beautiful Reign Crown of golden vines and freshwater pearl buds, or our Cordelia Tiara for the ultimate “ode to pearl” headdress.